Led by music teacher Rachel Kim, and back by popular demand, the choir from Branson School in Ross once again demonstrated their fine harmonies for Windchime of Marin on April 16, 2019. “Beautiful!”, “That was great”, and “awesome” were some of the comments. Be sure to listen to an excerpt of their rendition of “Bohemian Rhapsody” below. Many thanks to Rachel and all the students in the choir for bringing smiles to the Windchime Memory Care residents! The Mill Valley Middle School’s Orchestra and Bluegrass bands entertained more than 30 Aegis residents the other day. They played lovely orchestral pieces and got the audiences’ toes tapping with fun bluegrass! Directed by DARIA, 20 members of the Marin Harmony acapella chorus performed 15 songs such as “Under the Boardwalk”, “My Girl”, “You’ve Lost that Lovin’ Feelin’”, “Day Tripper”, “I Can See Clearly Now”, “Stand by Me” and 9 more for residents of Aegis in Corte Madera, Ca. on March 18. They had the enthusiastic audience smiling, clapping and singing along, with residents commenting afterwards on how wonderful they were and that they were going ask Aegis management to bring them back! One lady said they were "an absolute gift of talent that leads to love and peace". Thank you, Marin Harmony! 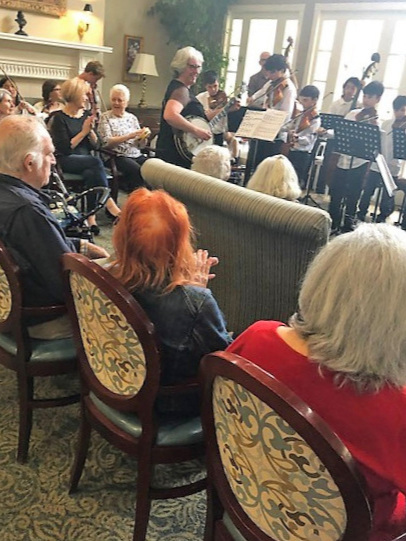 Bridging Thru Music volunteers and first-year high school students Natalia Betzler and Zach Lee did a combined set at Drake Terrace in San Rafael on Sunday, February 17, 2019. Natalia sang “Feeling Good” by Nina Simone, “New York State of Mind” by Bill Joel. “What a Wonderful World” and more; Zach sang “Blackbird”, “Can’t Help Falling in Love” by Elvis Presley. “Crazy Little Thing Called Love” by Queen and several others. Plus they did a couple of duets! Both will be involved in this summer’s Mountain Play: Natalia will open with her band, and Zach will be an ensemble performer. Many thanks to Natalia and Zach! Bridging Thru Music volunteer Karen Bevelander led residents of Three Home Village (San Rafael) in a group holiday sing-a-long on December 21, 2018. Lyrics in hand, well-loved standards including Deck the Halls, Let it Snow, I’ll Be Home for Christmas, Silver Bells, Have Yourself a Merry Little Christmas and many more were sung. Residents got into the spirit of the holidays and enjoyed singing them so much we sang some of them twice! Thank you, Karen! 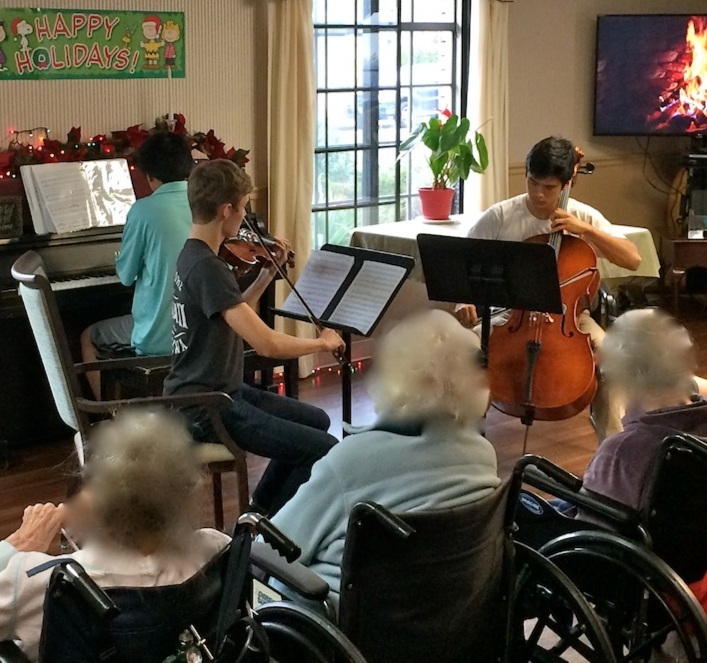 Led by Branson School music teacher Rachel Kim, 13 chamber music students took turns performing works by Mozart, Dvorak, Bach, Schubert, Faure, Tchaikovsky, and Mendelssohn for residents of Kindred South Marin in Greenbrae, Ca. on December 3rd. They played beautifully, with great passion and precision, dazzling residents who can’t normally get out for music concerts. Kudos and many thanks to Rachel and the students! Led by music teacher Rachel Kim, the choir from Branson School in Ross demonstrated their celestial harmonies for Windchime of Marin Memory Care residents on November 14, 2018. Singing some songs a capella and others with piano accompaniment, the selections included pieces by composers Pachelbel, Samuel Barber, Thomas Weelkes, and John Jacob Niles. They sounded beautiful and Windchime says they would love to have them back. Many thanks to Rachel and all the students in the choir! Tamalpais High School student Natalia Betzler enchanted the residents of Drake Terrace on Sunday Oct 14 with her astonishingly adept piano playing and fine singing. From classical pieces to songs made famous by The Beatles, Billy Joel, Etta James, Louis Armstrong, Carole King, and George Gershwin, there was something for everyone. LITA’s music coordinator Rob Thomure played the “Quiz Man” by asking some pop music questions between songs. Audience comments included “What a talent! !” and “Can she come back every Sunday?” Thanks, Natalia! 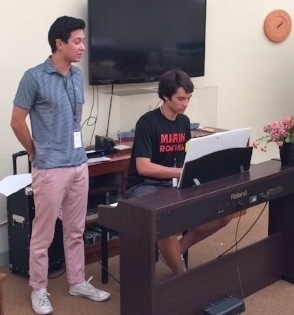 Two Marin Catholic High School students, Jake Chuharski and Nic Meringolo, performed in the Sun Room at The Tamalpais Healthcare unit in Corte Madera, Sunday September 16th. Nic played guitar and sang, and Jake was on keyboards and vocals. The Beatles “Let it Be”, two Frank Sinatra tunes, Elvis Presley’s “Burning Love” (with a few Elvis moves by Nic! ), Billy Joel’s “New York State of Mind”, a classical piece and some originals were part of the musical treats provided by the duo. There were smiles and applause all around- even the attendant behind the food counter said “great job!” Thank you, Jake and Nic!